Guyana is a small state in South America, but often visited by tourists, which generates international voice traffic. The mobile sector of the telecommunications market is well developed - today the penetration of cellular communication is about 90%. 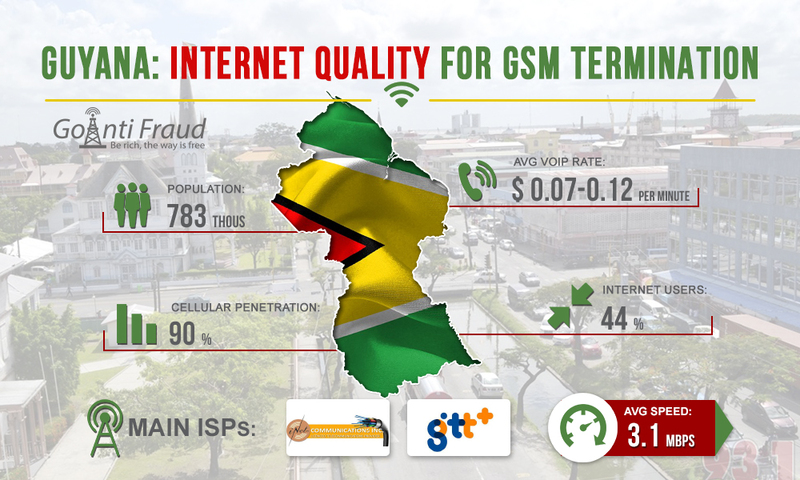 To make good money on calls landing in Guyana, you need to connect a stable Internet. At the moment, Internet connectivity in the country is only 40% (which is about 340 thousand connections). In recent years, the broadband access services market has grown significantly in Guyana, after opening of the submarine cable in 2010. However, the Internet remains slow and expensive, compared to other countries in the region. It is forecasted that one more submarine cable offered by Digicel will improve the situation with the cable infrastructure of Guyana in the coming years and will affect the reduction of tariffs for services. An average Internet Bandwidth in the country is 3.1 Mbps. This is not a very good indicator, but this speed will be enough for voip gsm gateway in pakistan to work on the minimum number of channels. In addition, in large settlements, one can connect the Internet with a higher speed for effective voice termination. The main players in the market of Internet services are GTT, iNet Communications, Digicel. However, currently Digicel offers only services for accessing the mobile Internet LTE, which is not suitable for successful termination of traffic. To improve the network bandwidth, you can use the SBO traffic optimization module from GoAntiFraud.